HIV laboratory in St Petersburg. Russia currently has two HIV vaccine projects in the works, a DNA-based vaccine being developed in Saint Petersburg and one called CombiHIV Vac from the Vector biotechnology institute in Novosibirsk. 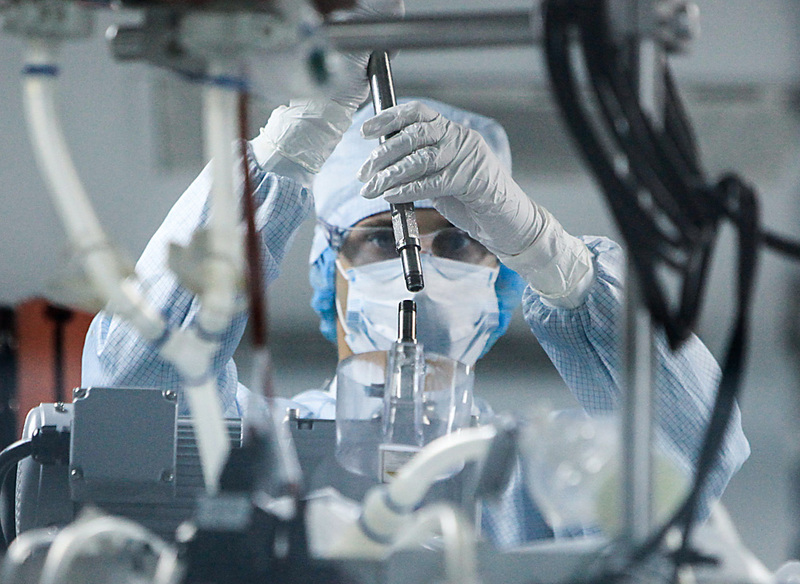 Two Russian HIV vaccine candidates have already completed important stages in clinical trials — one just this February — but both are constantly mired by lack of funds, pushing a potential rollout further and further into the future. Meanwhile, as Russian media reported this week, pharmaceutical companies have asked the Russian government to officially declare an HIV and hepatitis C epidemic — this status would allow mandatory licensing and production of antiviral drugs still protected by patents. With little state support available, scientists and healthcare professionals find themselves battling over money and facing absurd tradeoffs between expanding access to antiretroviral drugs, currently around a dismal 20 percent, and investing in vaccines. An estimated $1.5 billion is needed to end the epidemic in Russia, with just about one fifth of that sum currently earmarked for 2016. Russia currently has two of its own projects in the works, a DNA-based vaccine developed in Saint Petersburg and one called CombiHIV Vac from the Vector biotechnology institute in Novosibirsk. A third Moscow-based project, HIVREPOL, once hailed as very promising, has apparently lost traction. The two Russian candidates that are still standing have their own unique way of battling HIV, a virus notorious for mutating very quickly and attacking the very system that is supposed to protect the body. DNA-4 is basically a ‘composite sketch’, a set of four artificial genes from the virus intended to launch a targeted immune response. And CombiHIV Vac is more of a multitool with two complementing parts that try to do the same. Stage II clinical trial for DNA-4 in 54 patients was completed this February, and, according to Andrey Kozlov of the Biomedical Center in Saint Petersburg, the results warrant moving further. CombiHIV Vac was cleared for stage II trials over two years ago but testing cannot proceed without funding. Patchy funding makes bringing vaccines to market, or any research for that matter, much harder. As Kozlov puts it, you can’t really keep a research team together when there are ‘three or five year gaps’ between consecutive stages of development and testing. And Russian groups are not part of any major HIV vaccine collaborations, so they cannot leverage their support either. Yegor Voronin of Global HIV Vaccine Enterprise, an umbrella coalition on vaccine development, says, Russian scientists are pursuing specific avenues set out years ago, whereas global collaborations tend to focus on looking for newer, more promising approaches. Both vaccines have been in development since the late 1990s. The matter is time-sensitive for many reasons. DNA-4 specifically targets HIV-1 subtype A, a subtype of the virus that, until recently, dominated former Soviet countries as well as central and eastern Africa — but now state data shows it is losing ground to other subtypes, mainly through global migration. So, as head of the federal AIDS center Vadim Pokrovsky remarked, such subtype-specific vaccines may soon be of very limited use for the country. Meanwhile, elsewhere in the world, RV144, a first in HIV vaccine development, will go into large-scale efficacy testing this year. RV144 is a mix of two vaccine candidates quite similar to those developed in Russia, and it has the potential to become the first regional HIV vaccine, to be used in southern Africa. Other promising approaches at earlier stages include using broadly neutralizing antibodies. Interestingly, the global window for HIV vaccine development is closing too, albeit slowly enough for scientists to still hope to get through. Voronin explains that, as more and more countries move to pre-exposure prophylaxis, or PrEP, a strategy that involves individuals at a very high risk of infection taking antiretroviral drugs as a means of preventing HIV infection, scientists will have an increasingly harder time finding enough participants for clinical trials. An excited user on one of the largest Russian HIV online forums, who claims to have taken part in stage II trial for DNA-4, said she hoped that “if all goes well and corruption does not win, everyone will get [the vaccine]!” These are high hopes, as, according to Vadim Pokrovsky, the brand new 2020 strategy to fight HIV/AIDS in Russia, recently presented to the Russian government, fails to provide concrete support for research. Indeed, the one time the word ‘vaccine’ is mentioned in the current draft of the document refers to barriers in developing one.